Cool Hell Drivers video - Check it out Here!! This Saturday Dec.12th, at Calahan's, Detroit Blues Society is having it's one year event and Jim McCarty's and Mystery Train are the hosts this year, Bee will be their drummer for the event. The Hell Drivers are also playing live on the Mitch Albom Christmas Show on Thursday Dec.17th, live from the Ren-Cen atrium from 5:00 pm till 8:00 pm on 760 radio. Discover the heartbeat of music in this 560-page coffee table book illuminating the eclectic world of drumming over the past 70 years. Fotos By Folletts photographers traveled to over 53 cities and photographed over 500 drummers to be included in the pages of this captivating hardback. 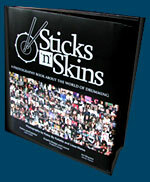 The first of its kind, Sticks ‘n’ Skins features never-before-seen photos and stories of legendary artists including Johnny Bee Badanjek, Louie Bellson (Benny Goodman), Steve Gadd (Barbra Streisand), Jim Keltner (Bob Dylan), Hal Blaine (Elvis Presley), Ginger Baker (Cream), Charlie Watts (Rolling Stones), Stefanie Eulingberg (Kid Rock), Uriel Jones (The Motown Funk Brothers), Jack Bruno (Tina Turner), David Garibaldi (Tower of Power), Danny Seraphine (Chicago), Anton Fig (Late Night with David Letterman), Nigel Olsson (Elton John), Chad Smith (The Red Hot Chili Peppers), Keith Carlock (Steely Dan), and many more. Diablos FLYER Halloween Party at Ye Olde Saloon, Royal Oak. 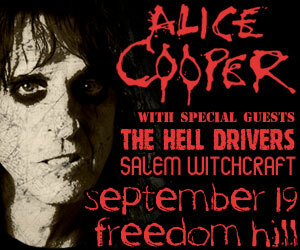 Pics of Hell Drivers backing up Alice Cooper, on 9-19-09. Taken by our webmaster, Linda Crosby . Watch the Hell Drivers video here, All the Puzzle. Another video submitted by Machine Gun on YOUTUBE. Check it out! Check out the blog and video by Dennis (Machine Gun) Thompson drummer from The MC5, which Bee is mentioned. Dane Gussen of the Talegator's Session from Harmonie Park Studio's submitted some pics to share. Video of Unfiltered Show on YOUTUBE . If you go through the uploads there's also an interview with three artists in the show: Dandylyon Shannon, Anita Andersons, and Mike Kelly in his studio. Submitted by Mike Kelly. Buddy Owen's band opened for Mitch Ryder back in 1965 in Miami. Pic added to Scrapbook. Gilda'a Club Breast Cancer Action on April 25th. J. Geils Band Gig review by THE FREEP. J.Geils Band picks The Howling Diablo's to be their opening act in Detroit . Friday and Saturday April 24th & 25th at The Fillmore Theater. The new band THE HELL DRIVERS are at Memphis Smoke (flyer) on the 18th and Calahan's on the 25th. Ted Nugent joins Bee at the Detroit Music Awards, see Scrapbook for couple of new pics. Flyer for Diablo show at Guy Hollerins, 4/11/09. Mitch Ryder And The Detroit Wheels are mentioned in the new book "Birth of Detroit Sound Clips". The history of the Detroit music scene from 1940-1964. More pics at our Books page. Modern Drummer except of "Great Parts = Genius" story out on newsstands Feb.3rd. Johnny is featured as an artist and his upcoming art show is mentioned in EMU Mag check out the article.